We seek to create a safe place to be known and to know other women. Each woman is unique in what life stage they are at, in their family dynamic, in their likes and dislikes, and in their strengths and weaknesses. 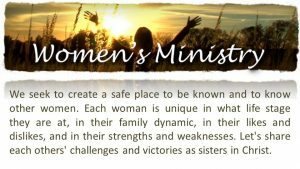 Let’s share each others’ challenges and victories as sisters in Christ. All are welcome to attend. This ministry meets on the third Tuesday of every month.